In my personal bible reading, I have once again worked my way through the Old Testament and am currently in the book of Matthew. Instead of reading through each chapter in my usual full speed ahead mode, this time I am savoring my time reading and sometimes rereading several times, the words and actions of Jesus. There are just so many details I have missed in the past. This time through, I am going to take my time and enjoy learning the details of the ONE who died for me. This morning I was dwelling on some verses in Matthew 16. Verses 24 to 27 are powerful, serious words! 24 Then Jesus said to his disciples, “Whoever wants to be my disciple must deny themselves and take up their cross and follow me. 25 For whoever wants to save their life will lose it, but whoever loses their life for me will find it. 26 What good will it be for someone to gain the whole world, yet forfeit their soul? Or what can anyone give in exchange for their soul? 27 For the Son of Man is going to come in his Father’s glory with his angels, and then He will reward each person according to what they have done. I have heard these verses throughout my Christian life so many times yet the weight of the message has never hit me harder than it did today. This is a message for the double minded. It is a message for the fence sitters. It is a message for the luke warm Sunday Christians. It is a message those who are trying to get their life worked out before they get serious about their commitment to Christ. This is a message for every person who claims to be a Christian. As a Christian we are to be a follower of Christ. To follow Him we must walk in His footsteps on the path that He leads us. 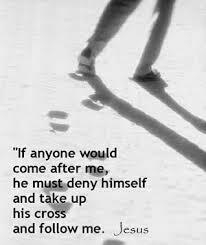 We must be willing to deny ourselves and take up our cross and follow Him. Denying ourselves is not easy but it is required. Taking up our cross is living a life of sacrifice but it is required. Losing our life and self interests for those of the Kingdom of God is not natural in the flesh, but is required. Christ didn’t just call us to Himself and than leave us with the difficult task of trying to figure out how we are to follow Him, He has equipped us! With the Holy Spirit living within us and the Word of God to guide us we are able to fulfill His purposes if we are willing. But in order to do so we must be willing to deny ourselves our own ambitions and take up our cross and follow Him, walking each day with the Holy Spirit guiding and teaching us how and where to serve. He may lead us into some dark places where He wants us to show the light and love of Himself to others. He may lead us to some very uncomfortable situations where we are to be His hands and feet. North American Christians have been blessed with inordinate amounts of freedom in following Christ. Denying ourselves is a difficult task because we are not used to denying ourselves much of anything when we have been blessed with so much. When it comes to taking up our cross, it is a decision that seldom results in our death. There are brothers and sisters in Christ, all over the globe that understand the high cost of both denying themselves and taking up their cross as they are living in countries where they may not only face persecution but death to do so. Many are martyred on a daily basis because they are willing to deny themselves and take up their cross! They understand the cost of being a disciple. For those of us in North America, things are changing. There is a rising rebellion and bitterness towards the church. One day we too may be called to give our lives for Christ. If so, we must do so willingly, knowing one day He will reward us for what we have suffered and done for His Kingdom. If we have made the decision to follow Christ, follow is what we must do. My prayer is that each one of us will lay aside those things that are holding us back and willingly say, “Lord I am ready to follow you completely! I am ready to deny myself, my selfish ambitions and comfort and am willing to take up my cross and follow you wherever You will lead me!” This is the heart cry of a disciple, this is to be the heart cry of every one of us who has made Jesus Christ our Lord. ← Say NO to fear and dread! In my personal faith journey, I have found that to victoriously follow Christ, I have to hear the Holy Spirit in my life. With all the competing noises in this world, it takes practice and effort to hear the Holy Spirit. I am still learning. Thanks for the encouragement today!